I used to reign Queen in the Kingdom of Dairy. Don’t believe me? Think that I’m exaggerating my personal importance to (and sway over) the dairy industry, when all along I would only eat a modest pat of butter every few days? Ha. Consider this: A typical breakfast for me consisted of two (or three) granola bars washed down with 500mL of milk at least. Every day. Lunch would include a cheese-flavoured bagel smeared with cream cheese and topped off with generous slices of cheddar. (No, I am not making that up.) Dinner would be homemade macaroni and cheese, a Greek salad tossed with large chunks of feta, or a large bowl of pasta topped off with a cream sauce and an avalanche of parmesan. My favourite desserts? Cheesecake. Ice cream. Frozen yogurt. Milk chocolate. Iced cappuccinos. Anything milky, creamy, and full of dairy. 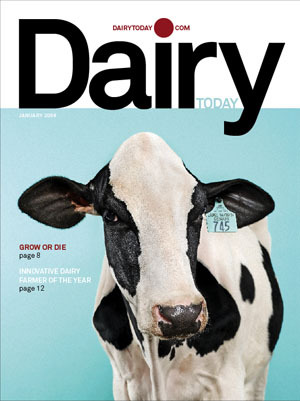 There is a whole *magazine* called “Dairy Today”. Who knew? Cover courtesy of Pentagram website. It would be an extreme understatement to say that I simply liked dairy. I loved dairy, craved dairy, and clung to dairy with the fevered grip of a woman possessed. Even though it made me feel phlegmy, congested, and wildly bloated within mere minutes of consuming it, I refused to give it up. Dairy was my right, my vegetarian prerogative. And even when numerous health professionals advised me to take dairy out of my diet, I resisted vehemently. No way, man– I’ve already taken out meat. You can’t make me take out anything else, especially something as ‘harmless’ and ‘innocuous’ as dairy. Dairy wreaked havoc on my digestive system, but it took me all the way up until last year to acknowledge and admit this to myself. Even as a young teenager, I literally sounded like a creaky old house when I tried to digest anything with dairy in it. My intestines would gurgle and sputter like rusty old pipes, and occasionally I even had to raise my voice to be heard over the groans of my churning bowels in conversation. (Classy!) Quite often, my belly would distend after eating dairy (which was basically after every single meal), and I would waddle around uncomfortably like an 8-month pregnant woman. Dairy did not agree with my system– at all– but I would not agree to cut it from my diet. At all. My best friend and I in early university. Notice her gorgeous peaches and cream complexion. Notice my not-so-gorgeous fire ants in the olive grove complexion… This was on a “good day”, otherwise I would have been too embarrassed to have my picture taken from close-up. If somebody had told me in high school that dairy (not “my hormones” or “an oily constitution”) was the prime culprit for all of my skin problems, I probably wouldn’t have quit eating milk products. I wasn’t ready to give it all up at that time in my life (eating dairy = social acceptance), and I was more comfortable with the idea of just taking expensive, extremely abrasive medications instead– even medications that were correlated with birth defects, much-higher-than-average risks for blood clots, and depression/suicidal tendencies. Cut out dairy?! No way, José!! Look at pictures of horribly deformed fetuses and then sign a waiver that promises my doctors, their extensive legal teams, and Jesus himself that I won’t ever get pregnant while taking Accutane, forever and ever amen? Meh. No big deal. Give me those documents to sign! And bring on the celibacy! Within mere days of cutting dairy out from my diet, I felt lighter, less bloated, and way less phlegmy. By the 3-month mark, I had dropped nearly 15 pounds from my average-sized frame (and that’s without changing even one other thing about my diet and exercise habits!) Today, about 15 months after cutting out all dairy (even butter) from my diet, I haven’t gained any “dairy weight” back. It’s off for good (as long as milk, cheese, yogurt, and butter are off the menu). I’ll get the occasional breakout still, but only if I am very stressed out, tired, or if I’ve eaten a whole bunch of flour the day before. It’s incredible to see how much my skin gauges and reflects my diet and lifestyle as a whole– I really can read it like a map now, whereas before I gave little to no credence to the idea that our skin reflects our inner health. I consider myself very fortunate to have already cleared this particular hurdle in my personal Beauty Detox Journey. (I first came across Kimberly’s blog when I resolved to examine the connection between dairy consumption and acne on a personal level– her post “The Acne-Dairy Connection” confirmed what I was suspecting about dairy products based on my own body’s symptoms and inspired me to take dairy out for good.) Anyway. Eliminating dairy from my diet was difficult on many levels, especially because I loved it and also because it is so prevalent in restaurants and a surprising number of packaged foods. (Read the labels– dairy, milk, and sketchy “milk ingredients” are everywhere!) I do think that having a sensitivity to dairy makes it easier to cut out; feeling horrible and/or getting acne because of dairy makes for a pretty powerful motivator to take it out! The biggest motivation for me, however, has been noticing the drastic differences between my body “on” dairy and “off” of it. Clear skin, better digestion, not as phlegmy or full of mucous, plus 15+ pounds lighter without having to think or worry about it? I’ll take it.